A new ChangeWave survey proves what many suspected: The iPad (s aapl) is contributing to a serious decline in the demand for netbooks. Not only that, but it’s also the tablet device most likely to be on customers’ wish lists going into the holiday season. Survey respondents who said they planned on buying a netbook within the next 90 days dropped drastically over the course of the past year. It accounted for 20 percent of laptop-buying consumer’s intentions in Oct. 2009, and now represents only 14 percent. Netbook demand has been dropping steadily since its peak in June 2009. The iPad fills the hole many were looking to fill with a netbook, specifically, that of a portable device for web browsing and media consumption. Pricing on the iPad is comparable to higher-priced netbooks, and Apple’s introduction of the MacBook Air should reel in consumers who want the portability of a netbook with a little more power, and have slightly larger budgets. ChangeWave found iPad owner satisfaction among respondents to be very high; 72 percent replied that they were “Very Satisfied” with Apple’s tablet, while another 23 percent said they were “Somewhat Satisfied.” The next largest group, representing only 3 percent of those surveyed, answered that they either didn’t know either way. Going forward, the prospects are good for the tablet market: 26 percent of all respondents say they’re planning a purchase in the future. Apple will reel in the majority of those customers, if current sentiment remains the same; 80 percent of those likely to buy a tablet are planning to get an iPad. RIM’s (s rimm) PlayBook is the next closest in terms of anticipated demand, with 8 percent of respondents choosing the BlackBerry solution. 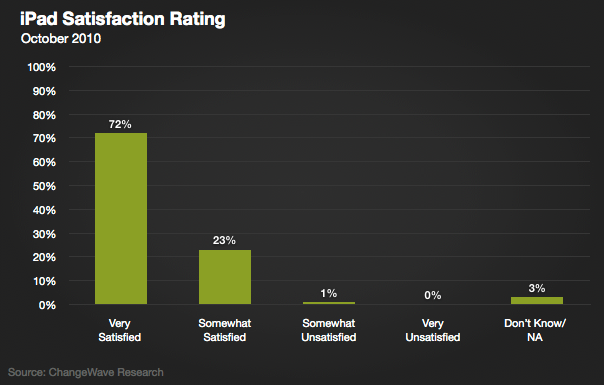 The iPad’s success in the survey shows it has two major advantages over its competitors. First, it’s far and away the first thing consumers are thinking about when considering a tablet computer purchase. Second, its very high customer satisfaction means that once customers do opt for an iPad, it will take a lot to convince them to switch device makers for future purchases. Apple is sitting pretty atop a market that should show a lot of growth in the coming year. Whatever the future brings from the competition, it’s very unlikely Apple won’t emerge the winner once again in 2011.
hmmm I read that link. No where did they provide PROOF that the iPad was cutting into netbook sales. That says (with proof, as in actual numbers) that netbook sales while down are still doing very well. Its looking like 38-40 million netbooks sold in 2010. Which is up from last year. How many iPads will be sold in 2010? Netbooks were starting to decline before the iPad in terms of its blasting growth. The growth rate is down the over all sales will be higher this year than last. 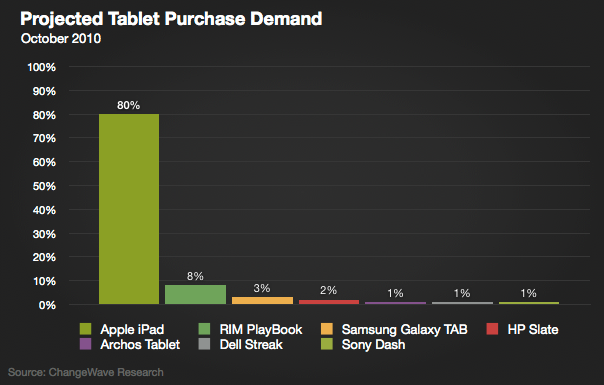 That speaks of market peak if anything and NOTHING of iPad stealing sales. The average netbook is $279-299…..half the price of the lowest iPad, almost 1/4 the price of the lower end Macbook Air. But this is the “Appleblog” and those headlines or umm link baits, need to be “magical” to attract the iFan’s. “The tablet market” is a made-up fiction. A bedtime story for techies. There is just Apple selling iPads and that’s all. Obviously these people haven’t seen the mac book air yet! I have a MacBook Air and an iPad and they are not even close to the same device. It is better to have an iPad and a desktop PC than no iPad and a MacBook Air. iPad replaces your printer in a traditional PC setup. MacBook Air replaces the PC. With both, you can do anything.